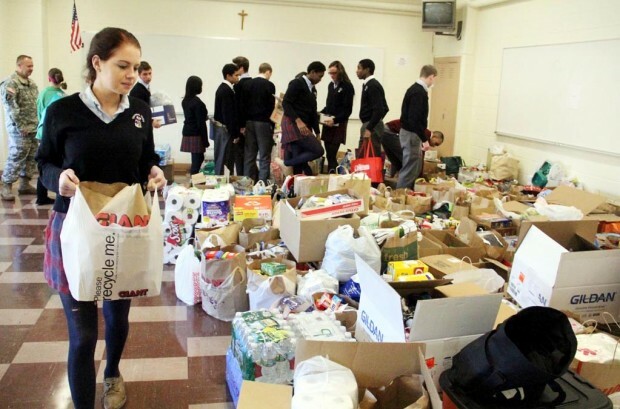 Students from Cardinal O’Hara High School in Springfield, PA collected non-perishable food items, toiletries, cleaning supplies and other basic essentials for victims of Hurricane Sandy during the week of November 12th. 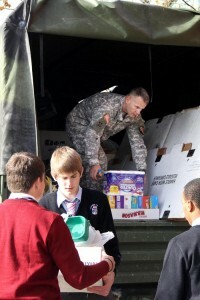 The students competed to see which grade could collect the most items. Their principal Dr. William McCusker promised a dress down day to the grade that won. All grades were so successful that it was too close to call. Everyone was promised a dress down day including the teachers who collected enough items to tie in the competition. Mr. Lou Osinski volunteered to move his classroom closer to the collection room 213 for the week to oversee the organization of the items. His physics class was on hand to help the New Jersey National Guard who picked up the items on November 20, 2012.